The twin personalities of this processor are the key to its power. A powerful stereo EQ. Twin Topology - two sonic characters in one plug-in. MS mode great for wide sonic treatments. Transparent results. 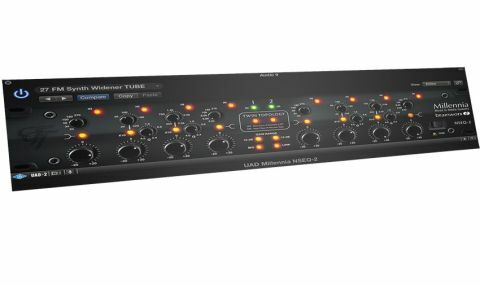 With its Direct Development Partner Program UAD has already released collaborative plug-ins, and the 'second' title bundled with its Version 7.1 software (alongside the Pultec Passive EQ Collection) is the latest - the Millennia NSEQ-2 Stereo EQ, developed for the UAD platform by Brainworx. "Millennia's processor has long been of primary benefit to top-end mastering engineers, with a cost of around £4K"
You might not have heard of the original hardware, as Millennia's processor has long been of primary benefit to top-end mastering engineers, with a cost of around £4K. However, awareness of its rare powers may well be about to explode via this emulation, which is available for a fraction of the hardware's cost. Unlike many other processors of this kind, Millennia's hardware offers a 'transformerless' design, which is considered by many the cause of its coveted, transparent sound. However, the second secret to the NSEQ-2's sonic potential lies in its Twin Topology design, which allows for two separate and alternate signal paths to be employed at the press of a button. The first of these is a Tube option, whilst a Solid State circuit also resides within, allowing you to compare and contrast the effects of these on your mix material very easily. "The stereo image to be de-linked to allow for individual adjustments to one side or the other"
It gets better - as the plug-in allows the stereo image to be de-linked to allow for individual adjustments to one side or the other, these circuits can be activated individually for each side. This is also true if you decide to employ the plug-in's MS Mode, where the left-hand set of controls adjust Mid and the right controls Side. These global controls lie in the centre of the interface but either side of these you'll find the four-band, fully parametric EQ controls for both channels. Each band can be individually activated via bypass LEDs at the top, whilst as well as offering Gain and Bandwidth controls, for the middle two bands, there's a x10 button which multiplies the 'stated' frequency of each by a factor of 10 (220Hz becoming 2.2kHz, for instance). The outer bands employ shelf filters with generous ranges, whilst cut/boost rotaries offer +/-20dB of gain control for each band. Usefully, there's a Trim control on the right-hand side, to help you tame the level of more dramatic parameter settings. Plug-in encoding of hardware 'classics', led by UAD and some of its rivals offer a deliberately 'retro' sound. Our crystal clear DAWs somehow beg us to include plug-ins which offer the warmth and sonic colour of yesteryear. Via its 'Tube Mode', the NSEQ-2 is absolutely capable of such sonic manipulation but what's most powerful here is the flexibility to toggle between this and the cleaner, more transparent flavour of its Solid State mode. Add in the powerful, mix-widening MS option and the opportunity to de-couple the stereo image to create or 'fix' unbalanced stereo material and this becomes a powerful, flexible processor. Which of its sonic personalities you choose to unleash on your mix is up to you but whether it's used on individual sounds, groups of drums or vocals or across a whole mix on the output channel, the NSEQ-2 is capable of wonderful results.